Microsoft has never been known for its design verve, especially compared to its rival Apple, so it shouldn't surprise anyone that its new logo for its feverishly anticipated Windows 8 operating system is being treated like a piñata by both design and high-tech critics. It's not like the Redmond bunch is trying to emulate the Gang That Couldn't Shoot Straight. All you have to do is read User Experience Director Sam Moreau's blog from Friday to realize that. "The Windows logo is a strong and widely recognized mark but when we stepped back and analyzed it, we realized an evolution of our logo would better reflect our Metro style design principles and we also felt there was an opportunity to reconnect with some of the powerful characteristics of previous incarnations," he writes. 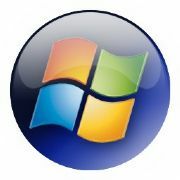 In considering the logo revamp, Microsoft wanted to return to the windows metaphor embodied in the original logo for the operating system. What sold the company on the new logo, according to Moreau, was a question posed by Paula Scher of Pentagram, who was to become the designer of the new emblem for the operating system: "Your name is Windows. Why are you a flag?" That's a good question. You have to wonder, though, why someone at Microsoft hadn't asked it before now. According to Moreau, the new logo meets a number of design goals set by Microsoft. The company wanted the logo to be both modern and classic. The new logo has the characteristics of signage at airports and subways, he writes -- probably not the best choice of examples for eliciting a positive response from users, considering the quality of many people's experiences associated with those venues. The logo also had to be "authentically digital" -- whatever that means -- and it had to be humble but confident, which sounds like something an oenophile would say about a wine than a technologist would say about an operating system. What Microsoft hoped the new logo would evoke and what it actually evokes, though, are two different things. Joe Wilcox of BetaNews writes, "There's something poetic about Microsoft changing Windows' logo during the centennial anniversary of Titanic's tragic sinking." He says the new emblem isn't distinctive enough and called it "a branding disaster." While E.D. Kain at Forbes likes the arrangement of the four blue panels in the new logo -- even if it does remind him of the Finnish flag -- he finds the emblem looks "washed out" when combined with the words Windows 8. "[S]omething about that makes the whole thing feel very not-modern -- certainly not up to par with what looks to be a very sleek overhaul of the Windows operating system itself," he notes. Graphic designer Armin Vit knocks the logo's combining a weak graphic with middle-of-the-road typography from the Segoe font family. The font is "extremely underwhelming -- pair it with the worst rendition yet of the Windows window and you have a real loser," he writes. He compares the graphic in the logo to "A window in a $400-a-month studio apartment rental with beige carpeting and plastic drapes." We dare say not quite the "authentically digital" look Microsoft was looking for. Admittedly, past Windows logos looked more like flags than fenestrations, writes Larry Dignan for ZDnet. "Unfortunately for me the Windows 8 logo gives me a window, but I want to jump out of it," he adds. The new logo may be bland, but that's not bad, Harry McCracken writes for Time magazine. "I like the logo," he notes. "Or at least I don’t dislike it." "I don’t think Microsoft is attempting to provoke profound emotions here," McCracken adds. "it’s a simple, low-key iconographic representation of the concept of Windows, and it expresses the same aesthetic as the Metro user interface which is Windows 8's most important new feature by far." The Register's Iain Thomson, though, probably expresses the feelings of many PC users about the logo when he writes: "[O]ne has to wonder why Microsoft puts so much effort into this sort of thing. After all, when was the last time somebody bought a Windows PC because they thought the logo looked pretty? Not even Apple fanbois take things that far."